Uses :- Temozolomide Capsules belongs to the group of cancer-fighting medications known asantineoplastics, and specifically to the group of antineoplastics known as alkylating agents.Temozolomide Capsules prevents the growth of cancer cells by interfering with the genetic material DNA, which is necessary for the reproduction of cells. Because cancer cells reproduce more quickly than normal cells, cancerous cells are targeted by the medication. 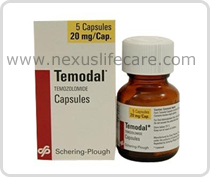 Temozolomide Capsules is used to treat specific types of brain tumours.